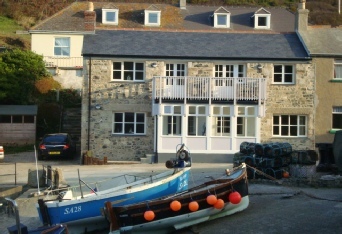 Island View is in the unspoilt picturesque fishing harbour of Mullion Cove and located next to the Cornish Coastal Path. Tourism is considered fairly low-key in this beautiful area making it an ideal holiday retreat. Children can play safely on the beach directly in front of the property, and at low tide there is plenty of fun and adventure to be had building sandcastles and exploring the hollow cave which leads to further beaches and rock pools. You can even partake in Kayaking from the harbour. Adjacent to Island View is the Porthmellin Tea Room which has an extensive daytime menu including excellent freshly made Crab Sandwiches and traditional Cornish Cream Teas. Island View is five miles north of The Lizard, the most southerly point of Great Britain, famous for its colourful serpentine stone. The attractive village of Mullion is one mile away and has many local amentities including well-stocked shops, art galleries, local craft shops, restaurants, pubs and cafés. There is also a links golf course, horse riding, a diving school and three Churches: Church of England, Methodist and Roman Catholic. 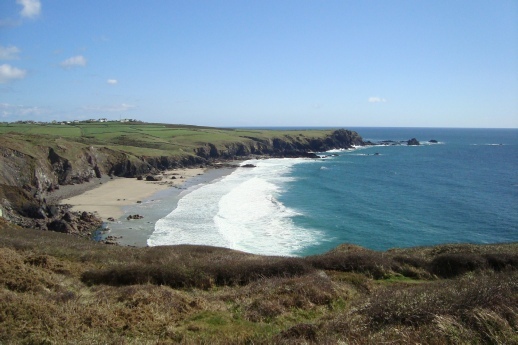 There are various coastal walks in both directions along the rugged and dramatic cliff paths. Within 15 minutes, the path can lead you to both secluded and popular sandy beaches. Close by, the coastal route has been designated an Area of Outstanding Natural Beauty. Dartmoor ponies and other livestock are often seen grazing amongst the colourful gorse, heather and seathrift along the cliff tops. In bygone days local smugglers and shipwrecks were commonplace in the seas below the high coastal paths. Nowadays, perhaps you’ll be lucky enough to see seals bobbing in the water, and basking sharks in the warm weather. Five minutes walk along the cliffs behind the house sits Mullion Cove Hotel with both a bar and restaurant, open to non-residents. This can also be accessed by road,. Boat trips can be taken from the harbour for pleasure or to fish, and fishing can also be done directly from the piers with a rod and line. 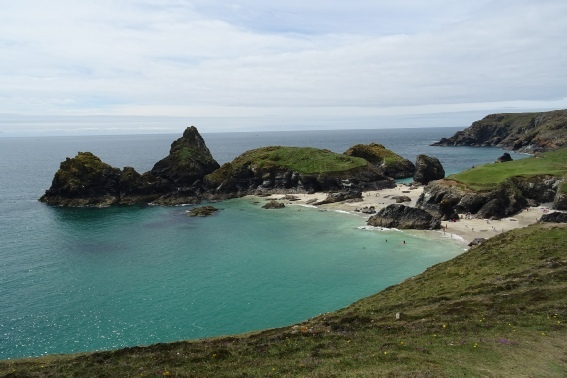 The lovely sandy beaches of Kynance Cove and Poldhu Cove can be accessed via both the Coastal path on foot or in the car. Poldhu is famous for it’s sand and surf as well as for being the point from where, in 1901, Guglielmo Marconi sent his first wireless message across the Atlantic to Newfoundland. The Marconi Visitors Centre, at the top of the cliff above Poldhu Cove is also open to the public. A little further along the coast is Gunwalloe Church Cove, where a tiny Church can be found nestled into the corner of the golden sandy beach. There are other typical fishing villages close by such as tiny Cadgwith Cove and Porthleven, both worth a visit in the car. Nine miles away is Helston, Island View’s nearest town. Each year on the 8 May, the locals celebrate Flora Day by dancing the well-known Floral or Furry Dance in the streets and houses of the town. For real ale lovers, Helston is also home to The Blue Anchor, the 15th century pub famous for brewing its own beer, known as Spingo. Be warned, it is very strong! Other towns within a 45 minute drive include Truro, the capital of Cornwall and its Cathedral surrounded by cobbled streets, Falmouth which is home to Pendennis Castle and the recently redeveloped Port Pendennis with trendy cafés and bars. To the west is Penzance and nearby St. Michael’s Mount, accessible by foot at low tide. Also popular are Lands End and St Ives, which is home to the Tate Museum. Other attactions within an hour’s drive also include the open-air Minack Theatre located on the stunning clifftop location above Porthcurno as well as the award winning Eden Project, built on the former china clay pits near St. Austell. Flambards is a local theme park offering a fun family day out. One of its most recent additions is the One2Eleven children’s indoor play area open 360 days a year, a great rainy day attraction. The National Seal Sanctuary at Gweek is also only a short drive away as is Roskilly’s Farm famous for it’s delicious ice creams.